Alexander Nemerov, "The Flight of Form"
Keith Moxey: The essay asks, on the first page, “What do artists and poets and critics do in the face of catastrophe? How do they register it in their work, or should they even try to do so?” Nemerov points out that even if Auden refused to infuse his poetry with the leftist politics he subscribed to in the years leading up to the Second World War, his poem “Musée des Beaux Arts,” offers us what might be described as an apolitical political position. 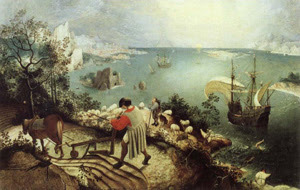 Writing about Bruegel’s sixteenth-century painting “The Fall of Icarus” in the Brussels museum, Auden exploits the “dissonance” in the work’s facture, the occlusion of its narrative subject, so as to make the poem a political allegory. Just as Icarus’s fall goes unnoticed by the other figures in the picture, so the injustices of war, man’s inhumanity to man (which Auden had experienced at first-hand during the Japanese invasion of China), go unpunished.… This formal dissonance, this political obliqueness, constitutes a political statement that differs radically from straightforward ideology critique. 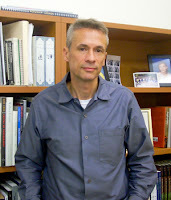 Michael Holly: It’s not for nothing that Alexander Nemerov is the son of the poet, Howard Nemerov. The writing here is so luxurious, so—in an old-fashioned way—aesthetically pleasing, so graceful, so resonant, that it raises other observations, such as how writing about some visual matters solicits a certain poetry not available to others. Keith Moxey: I think that is quite clearly something he cares about. He is Auden, in a way: he is obliquely reading the great poet’s work, reminding us that his apparently apolitical writing, a poem on a painting by Bruegel, has its politics. The discussion continued from there on both points, writing and politics. I'll quote more at the end, but I want to try to develop a way of talking more precisely about the writing in Nemerov's essay, in order to be more exact about what kind of reading both Keith Moxey and Michael Holly are implying here. Beginning sometime around 2007 or so, and continuing to the present, Nemerov's style of art historical writing has often been taken as exemplary. In my own experience, he has been cited by graduate students in a half-dozen or so institutions, mainly in North America, as one of the discipline's optimal models, and professionally he has often been the subject of conversations about the discipline's state and its future. Those conversations tend to turn on four related qualities that are attributed to his work. First, his writing doesn't obey what are taken as the standard conventions of cause and effect; instead it brings together apparently disparate moments and objects in culture and weaves them together, creating an unexpectedly richer and broader sense of art practices. Second, it is interdisciplinary in salutary ways, bringing an unaccustomed variety of political, social, literary, and economic considerations together with the visual art that is its subject. Third, the writing itself, as Michael Holly says, is understood as beautiful, and its beauty is taken as necessary for the persuasiveness of the connections Nemerov wants to make. And fourth, Nemerov himself is often described as crucial to the effect of his writing: his speaking style, both in public and in conversation, is described as charismatic, and he sometimes speaks without notes. The third and fourth of these might seem optional or debatable, and it's funny to be reporting on them given that I've never met Nemerov. But rhetoric is exactly what is at stake here. In print, most of what has been written about Nemerov concentrates on the first and second points, but in seminars and elsewhere, the rhetoric and the beauty of the writing are part of the way his enterprise is described. In reading "The Flight of Form" for its writing, I want to try to produce a set of guidelines that can sharpen claims like the first and second ones. Afterward I'll say something more about the third point. "The Flight of Form" is structured as a series of unexpected transitions from Bruegel or Auden to other artists, writers, places, and events. Its persuasiveness, as history, depends on its coherence. Let me call those surprising changes of subject leaps of faith. The first one happens a couple of pages into the essay, when Nemerov is talking about a book that Auden and Isherwood had just finished on the subject of the Sino-Japanese War. 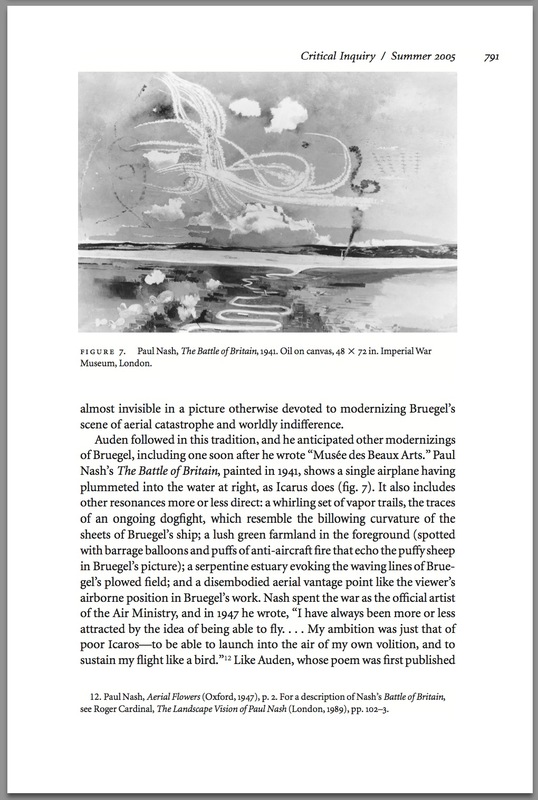 Nemerov reproduces some images from that book, including one of children captioned "With legs" and "Without legs," and comments, "Bruegel's Icarus, with legs, must have conjured these scenes to the person who had witnessed them so recently" (p. 784). 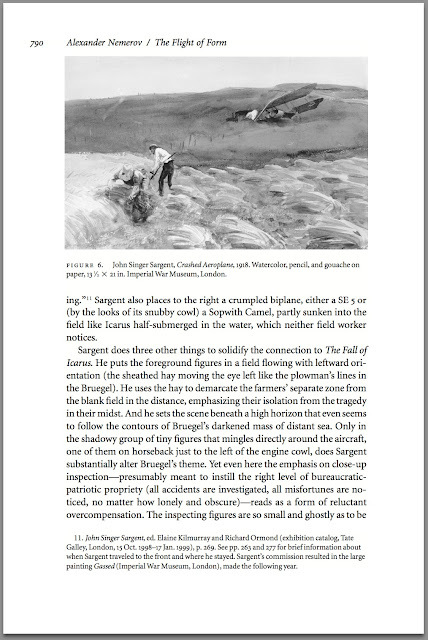 A few pages earlier he had reproduced Bruegel's painting (in black and white, and turned on its side in the original Critical Inquiry version). 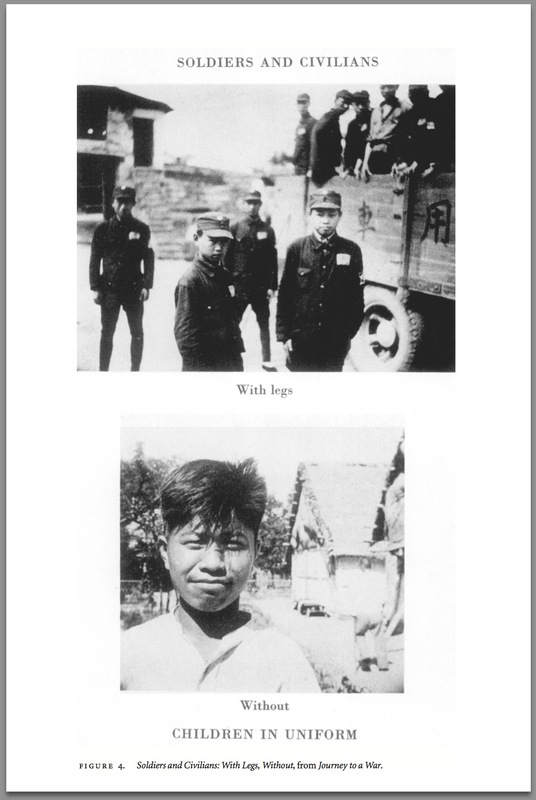 This assertion—that Auden must have been thinking of the photos of boys, and of his experiences in China, when he looked at the Bruegel—is not supported in the usual way, which would be some diary or other record in which Auden says what he was thinking. The leap of faith (sorry for the italics: I think it's helpful to underscore the elements of the writing) stands, for the moment, on its own, and that is part of how it functions: the reader has to be left thinking on her own for a while before the justifications are presented. There follows a passage from the book on the Sino-Japanese war, in which Auden and Isherwood watch an aerial battle, squinting into the sun to try to see the planes. They can only see planes when the sun flashes "on their turning wings." Nemerov remarks: "Icarus, the boy falling from the sky of whom Auden wrote eight months after the air battle, precisely figures these other aviators, the sun flashing 'on their turning wings' (pp. 784-5). Here the expression "precisely figures" is a rhetorical figure because the passage he has quotes does not "precisely figure" anything like the Bruegel painting. It's an imprecise parallel, in need of explanation. Let me call this the rhetoric of attachment, by which I mean expressions that tie together passages that might otherwise seem loosely connected or unrelated. Calling the connection "precise" is an auxesis, a figure of classical rhetoric and a kind of hyperbole: it's an intentional overstatement, intended become plausible in context. In some places Nemerov introduces a leap of faith at the same time as he demonstrates the rhetoric of attachment. Another photograph from the book on the Sino-Japanese war shows soldiers looking up to the sky. For Nemerov, this emphasizes "Auden's attention that year to minute and almost indiscernible life-and-death dramas taking place in the heavens" (p. 785). The leap of faith is the notion that this photograph is evidence that Auden was thinking of looking at distant objects in the air "that year," and the auxesis, the rhetoric of attachment, is Nemerov's helper verb: the photo "shows" the soldier, but "emphasizes" (rather than just supports) Auden's interest "that year" in these sorts of phenomena. "Emphasizes" (the original uses the gerundive) overstates the connection, implying it is already made and only needs underscoring. This doesn't add evidence, but images. It's a well-structured sentence, with alliteration ("particular point"), isocolon (repetition of structures in three successive phrases), and assonance ("flaring and glittering"). The sentence has four phrases, three short and the last one long; if this were a line of poetry, it would be a tetrasyllable, and even more technically a quartus paeon—three short syllables and a long one. It's a good sentence, but it isn't logically necessary: it's a sort of poetry of attachment, increasing our sense that the book on the Sino-Japanese war is connected to the poem on Bruegel. It is possible to add several more devices to this list. I'll use the expression rescue rhetoric for passages where Nemerov adds additional links to a connection that may seem to be not yet entirely plausible. 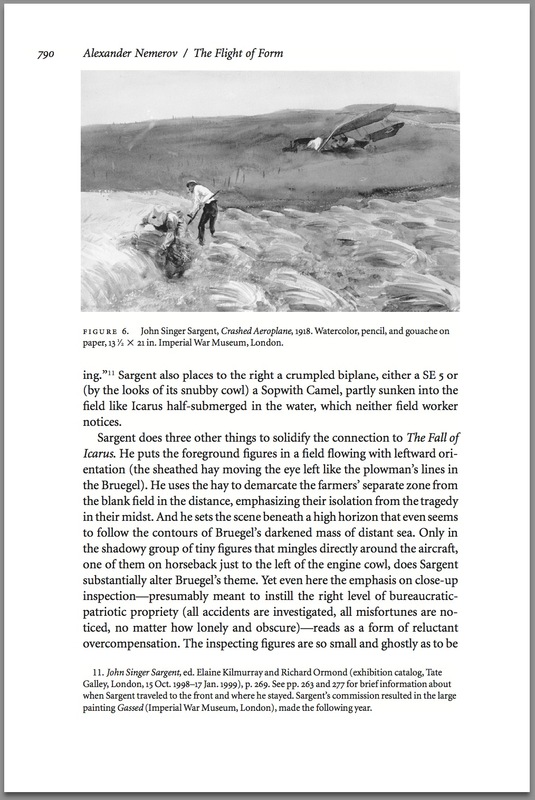 This happens for example when he wants to say the John Singer Sargent painting Crashed Aeroplane is an echo of Bruegel's painting. He identifies some similarities, and then (unexpectedly, at least for me) goes on to add three more (p. 790). These are distant parallels, all of them arguable—for example that the distant hill echoes the "darkened mass of distant sea" in Bruegel's painting—but together they make such a large group that I think a reader might have difficulty keeping them all in mind at once. They correspond to one of William Empson's higher types of ambiguity: they exist, for a reader, as a cloud of ideas rather than a clear list. One final device: the deliberate overstep might be a way of naming a technique that I think is also used, deliberately, by Michael Fried: it's a claim that cannot be taken seriously on its own. This apparently paradoxical strategy can be quite effective: when a reader comes across such an assertion, she may think, Well, I can't possibly accept that—but then by contrast the rest of the argument comes to seem more plausible, partly because the decision of what not to accept was the reader's, and by making it she has drawn a line of her own instead of relying on the authors'. (I wrote about this in relation to Fried's essay on the Burial at Ornans in Our Beautiful, Dry, and Distant Texts.) In Nemerov's essay an example could be the claim that the "traces of an ongoing dogfight" in Paul Nash's painting The Battle of Britain "resemble the billowing curvature of the sheets of Bruegel's ship" (p. 791). I don't think too many readers will find that convincing, but it's possible a certain number will have my reaction, which is that this is a step too far, but that by contrast some of the other claims might be more plausible. It's as if the reader thinks, I'll throw out that one, but maybe I'll keep most of the others. The deliberate overstep, rescue rhetoric, the poetry of attachment, and the rhetoric of attachment are my overly formal names for rhetorical figures in the text. I've been calling then "devices" and "strategies," but it is not clear to me that Nemerov imagines them that way—as if he was a Cicero or a Quintilian, analyzing as he goes. It is enough that attentive readers will, I think, notice these figures as they read. I imagine readers might even spend as much time pondering these devices, and adjusting their own doubt or assent, as they will absorbing the argument. Rhetorical performance is part of what Nemerov is doing here, and writing is openly what creates the history. When he goes too far, or adds too many extra comparisons—for me this happens leading up to p. 800, where he tells us that Ovid, too, liked to put "resonances" in his narratives, as a way of justifying visual echoes in Bruegel, as a way of justifying the link between the plowman and the world he ignores—then the explicitness of the role of writing, and the reader's self-conscious attention to the writing, becomes that much more unavoidable. For a previous generation Nemerov's way of writing art history, which takes disparate ideas, works, and moments and brings them together, would have been understood as an invocation of the Zeitgeist. A more recent precedent, which is strangely almost ignored in the reviews and conversations praising Nemerov, is New Historicism, which has long practiced these kinds of unexpected and even distant connections between historical moments and ideas. Writers like Stephen Greenblatt might be closer parallels than some literary figures. And as distant cousins, inventive historians from Burckhardt to Pater and Longhi: in other words, scholars, rather than writers. All of those scholars provoked discussions about the limits of truth in art historical narration. He then cites Jane Gallop (on psychoanalytic criticism), Roland Barthes's Camera Lucida, Michael Fried, David Lubin, and Bryan Wolf as historians who "build interpretation out of intuition." This passage is somewhat entangled if not confused: it appeals to "something like intuition," psychoanalysis, affect, "a critic's attitude," and "idiosyncratic" responses. Several of these—especially the mentions of Camera Lucida, psychoanalysis and "subterranean" responses, and affect—are similar to starting points of this project, and point, I think, away from history and toward writing in general, including criticism and fiction. Other concepts can be more plausibly harnessed to the purpose Nemerov has, of writing art history. Even though I can't be sure how to read this passage—it seems to want several mutually incompatible forms of untraditional writing—at least it is more promising than debates about the veracity of Nemerov's "metaphors" and arguments. I mention all this here just as a sign of how delimited art historical discussions have been. Perhaps more attention to the writing itself could provide footholds for more open discussions. The essay's point is the retreat of intellectuals from political activism in the years leading up to the Second World War. That is Auden's theme in taking up Bruegel, and it is Nemerov's purpose to show how widely it resonated. That theme leaves a large question unasked: what is Nemerov's position in all this? Would he advocate the "apolitical" in contemporary art, or in scholarship? Why write this essay, why ruminate on these themes, in 2005? And why did Tom Mitchell publish it in Critical Inquiry? I'm not asking here for gossip or incidental contexts, but for a sense of why the essay seemed important or pressing in the first decade of the twenty-first century, and what Nemerov's stake in the "apolitical" (Auden's coinage, apparently) really was. Moxey's purpose in bringing Nemerov's essay to the Chicago seminar was to suggest a model for current practice. So it is interesting that Nemerov's essay remains absolutely silent on the question of its author's politics. The absence of a page or two on Nemerov's own position in relation to the political in art and scholarship is especially difficult to understand given the essay's continuously surprising openness to questions of history's function, and scholars' and artists' places in politics. I can imagine Nemerov might say that this is, after all, an essay on the late 1930s, but I think the very structures and awarenesses of the writing open the way for the author's voice, and an articulation of his own interest. 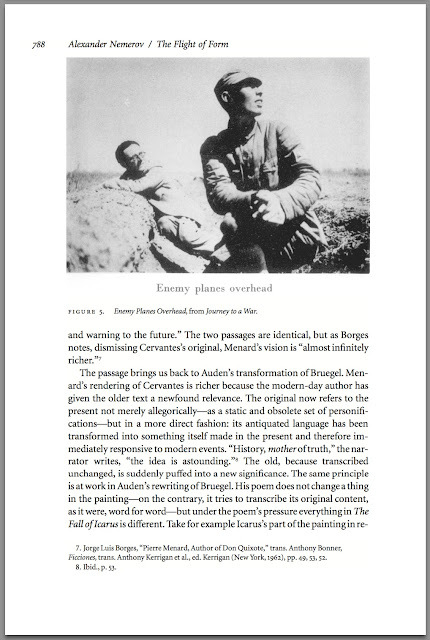 A style as self-aware, dialogic, and resourceful, as Nemerov's, put to a subject that is exactly about self-awareness, makes it impossible to understand why the practice of art history appears, in the implicit logic of the essay, to require the exclusion of part of the author's voice—exactly the part that could tell us about the essay's urgency and pertinence in 2006. I'm anxious not to be misread here: there are many ways that scholarship can be political without being explicitly so, and Nemerov's work already points to a politics: or perhaps I could say that any body of historical work is by its nature a politics. What I mean to draw out is a puzzle in the structure and logic of the writing itself: unlike a lot of other art historical writing, Nemerov's work is replete with doubt and reflection, even on the subject of writing itself, and so the structure of the work itself includes an open space for the inclusion of something like the author's commitment. It's a structural, narrative, writerly question I am after, not a biographical one. I remember sophomore year for English 82, reading James Joyce’s story “The Dead” in my dorm room. I remember coming to the end where Joyce describes the snowflakes falling on, as he says, “the mutinous Shannon waves,” the waves off the coast of Ireland [sic, incidentally: Joyce is talking about the river, and contrasting it with the Bog of Allen, source of the Boyne: that is, two of Ireland's principal rivers, one flowing east and the other west], and I just remember sitting up—and even now I have goosebumps—sitting up and feeling that the world had been changed for me at that moment. I ask myself now, “Why was that?” The best answer I can come up with is that at that moment I was discovering not who I was, who I am, and not what the world is. I was discovering the otherness of the world. And I was making that otherness a part of myself, all that which I cannot see, cannot know, and yet which becomes as of that moment a part of me. And so, thinking about us now, I say that the purpose of studying art or making art is not about individual fulfillment, it’s not about learning who you are, it’s not about learning what the world is, it’s about accepting and making a part of oneself the otherness of the world. And so may it be for all of you. This is also a declaration, not of the apolitical, exactly or directly, but of something that could accommodate the apolitical: it's a declaration of philosophic allegiance. There is room in "The Flight of Form," I'd say, even for this. What kind of writing is it? James Elkins: This is a great opportunity to discuss writing in visual studies, and more generally in art history and beyond. We have Benjamin’s “Author as Producer” on the table, and so writing is an pertinent question in relation to politics. But Michael, I am sorry, I have to disagree. For me there is an enormous difference between Nemerov’s writing and the Auden he quotes, and it works to his detriment throughout. I would agree with the words you use to describe Nemerov’s writing, but to me they are all pejorative: it’s continuous, flowing, seductive, belletristic—all the things that someone like Martin Amis, or Nabokov, or even George Saunders or Lydia Davis or William Vollmann would run from. Michael Holly: Alex’s writing is a continuation of the work he is talking about. James Elkins: Well, the fact that we can see this so differently shows how much visual studies and art history need to begin talking about writing. I have not spent time with the Bruegel painting, but for me it is entirely different, even in its imputed oblique politics, from Nemerov’s prose. Bruegel is awkward, wayward, surprising, static, and “dissonant.” Nemerov is placid, warm, weakly beautiful, flowing, never sharp, always mildly hypnotic, unpleasantly tranquil. If authors are producers in Benjamin’s sense, and if their writing produces a politics, as Keith is suggesting, then this is just the kind of escapism that you described as the state of affairs in the old art history. I was annoyed, at the time, because I'd had several conversations with students who had been praising Nemerov's style without being able to say why, or where the style came from, except by mentioning his literary family. I should perhaps have answered Michael Holly differently. A better response might have been: it's true that this essay could be understood as adopting a writing style consonant with the subjects of the essay. But that would only be a defense if Nemerov altered his style to fit different subjects, and I don't think that's the case. If I temporarily, and, I entirely admit, artificially, bracket out questions of art history or art criticism, and think of Nemerov only as a writer (in a full sense, meaning as compared to fiction writers) then the style is old-fashioned. It belongs to a lineage from Pater through Woolf, say, but especially on to the generation of the mid-twentieth century English and American writers and poets. The writing itself, in this particular and artificially delimited sense, is not interesting. Within art history, it is very interesting, and that contrast is exactly what concerns me. A compelling, insightful look into the popularity and occasional idiosyncrasies of Alexander Nemerov’s approach to art historical analysis, though I think at moments this discussion doesn’t completely take into account the ideas behind his method, or really, the approach of a group of historians, like Bryan Wolf, David Lubin, Allan Wallach, that tend to view a work of art a bit more expansively and holistically. This more “intuitive” approach, as I think it’s sometimes erroneously called, is sometimes called the “Yale Methodology” stemming from the work of Jules Prown who Nemerov trained with at Yale. Back in the ‘80s and ‘90s, Prown seemed to defy simple categorization as a standard art historian. Like all art historians he stressed the importance of the object itself in his groundbreaking book, ‘Art as Evidence,’ but beyond that, he believed that a singular work of art had deep roots within aspects of cultural and anthropological history and literature. Reading a William Sidney Mount or a John Quidor in relation to Washington Irving or Nathaniel Hawthorne deepened our understanding of the work, adding new shades of context, which this discussion aptly highlights. Though I don’t think this approach is exclusively intuitive. True, as in Nemerov’s reading of Breughel’s painting, in relation to the Paul Nash or the Sargent, may at first seem like a loose association, but Nemerov is stressing the importance of underlying continuities that may escape our initial readings. His approach is strange and risky, but his intention is to move a reader or viewer out of his comfort zone. I can easily see where critics to this approach would be skeptical, but it offers a different way of viewing a work within a larger trajectory of humanistic enquiry. There might indeed be a Paterian element to this type of reading, based in literary studies, but it’s not merely intuitive or wholly subjective. Also, I imagine when Michael Ann Holly cited Nemerov’s family as an aspect of his eloquence and approach to analysis, I don’t think she was merely name-dropping or reminding us why Alexander Nemerov is a distinctive speaker and historian, but rather, tying Nemerov’s work into a broader scope of what the role of a contemporary thinker, whether he’s an art historian, poet, author, painter, etc., is in our time. It’s striking to me that the approach of historians like Nemerov, David Lubin and Bryan Wolf, can sometimes be seen as polarizing within academic art history, but I believe they offer a voice that, though personal and unconventional at times, is inclusive and open to reaching out to a larger audience. Their work reminds me of the risks and successes of historians like Aby Warburg and Meyer Schapiro, which is what makes their readings so enduring. Thanks, Farisa. I agree a fuller understanding would bring in the historiographic context; I'm just hoping this project of mine -- looking at writing inside and outside the discipline -- can make sense as it gathers readings. Many thanks to you, Professor Elkins, for your thoughtful and apt response, and for this brilliant essay. This examination of Alexander Nemerov’s style and approach is important as it gets to the core of the motivation and ideas behind methodology in art history. Looking at the writing from both the inside and the outside, as you rightly say, the way to go. The curious thing is that I think Nemerov and Bryan Wolf and the others we’ve mentioned are perhaps reluctant to think of themselves as being pinned down by a particular methodology, though this approach to art history, what’s been called by some critics as the more “literary” approach to looking at works, is what they’ve become quite famous for. But I agree with you that looking at the way this analysis is done, examining the ideas behind what might initially seem like disparate connections, is highly relevant and a vital mode of inquiry. I look forward to reading more of your work.